Young Edition. Composed by Charles Mingus. Arranged by Sy Johnson. 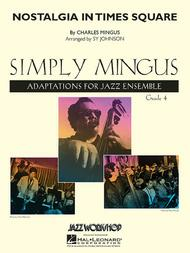 Simply Mingus for Jazz Ensemble. Score and parts. Published by Hal Leonard (HL.7011441). Originally written for the 1959 John Cassavetes film “Shadows,” Nostalgia in Times Square is a medium tempo blues but with a unique harmonic structure. Beautifully scored for younger ensembles by Sy Johnson, this chart includes a flexible solo section for any combination of alto, tenor, trumpet or trombone.